I have now done two runs in a row of three miles or greater where I have had no pain in my right knee. I am cautiously optimistic that maybe whatever was wrong has finally healed. Strength work! I’ve tried to do this every day, but things come up (Bonnaroo, I’m looking at you) and I don’t always. But some is better than none! Limited my running to three days per week. I noticed the knee would start hurting sooner in the run if I ran two days in a row, so I decided to only do three runs a week (with at least one day of recovery between each) until I noticed some improvement. As soon as I start being able to manage higher mileage on those days, I will increase back up to four days per week and see how that goes for a while. I have no plans to go back to five per week at this time. Ceased running within half a mile of feeling pain. I didn’t want to be stupid and make it worse by trying to run through it (not that I really could after a certain point). This is why I haven’t really done any running longer than 3.5 miles or so in the past month, except the five mile race. Physical therapy? I’m still contemplating going to physical therapy, just so someone can actually tell me if something is improving and to watch me run or do my strength work and let me know how I can improve. Low heart rating training? I mentioned that I wanted to try this eventually. Maybe now is a good time? It would keep me slow (and I mean sloooooow), which would hopefully keep me from getting too much ahead of myself. I’m going to attempt a longer run this weekend. The true test! 30 reps on each side. 20 reps on each side. Similar to clamshells, except you hinge at the knee instead of the ankle to work different muscles in the hip area. I like this awkward-looking drawing because I feel awkward when I do them. 25 reps on each side. I have to make sure my hips are rolled forward a bit in order to feel this where you’re supposed to feel it. But once you are in the proper position, it burns! From bridge position, lift one leg as if marching without moving the hips. Lower and repeat with the other leg. That is one set. 10 reps on each side. Cross one leg over the knee and raise up to bridge position. Hold for a beat, then lower back down. My glutes/thighs are usually on fire by the time I get to the single-leg bridges, and I typically don’t make it through all ten on each side. 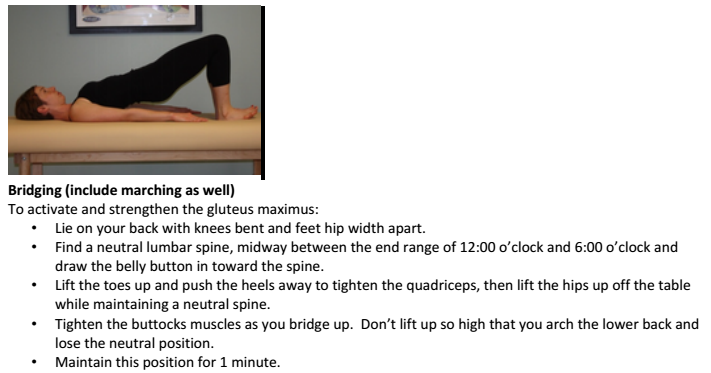 Wednesday’s physical therapist (who sent me three of these exercises) said it is better to not do an exercise than to do one with bad form. So if you feel your form disappearing on any of these exercises, stop the workout. Focus on quality versus quantity. Monday I went in for the second injury screening of my life. The first one was, of course, when I hurt my calf and my hip earlier this year. I basically knew that I kind of had the same problem going in, except on the opposite legs and my ankle instead of my calf this time. If you don’t remember, back in June, I hurt my right calf, but continued to try to run and walk on it, which then made my left thigh/hip hurt from overcompensating. This time I hurt my left ankle, but continued to walk on it (I blame The Mo Run) and ended up hurting my right thigh/hip due to overcompensation. I will learn one day. So, I went to an injury screening with Results Physiotherapy at Nashville Running Company. My appointment was at 5:45, and I showed up around 5:40. The girl at the desk said the therapist was running late, and there was one person in front of me who was out walking her dog. I had a seat. A couple minutes later, the girl before me walked in, and it was Jessica that I had met at the half marathon info meeting the Saturday before! We chatted until the therapist showed up, then I filled out a form while he went through exercises with her. Soon it was my turn. I explained what happened and what I’d been doing. He poked and prodded at me, mainly focusing on my thigh/hip, since I really can’t feel my ankle pain as much, unless you directly press on it. 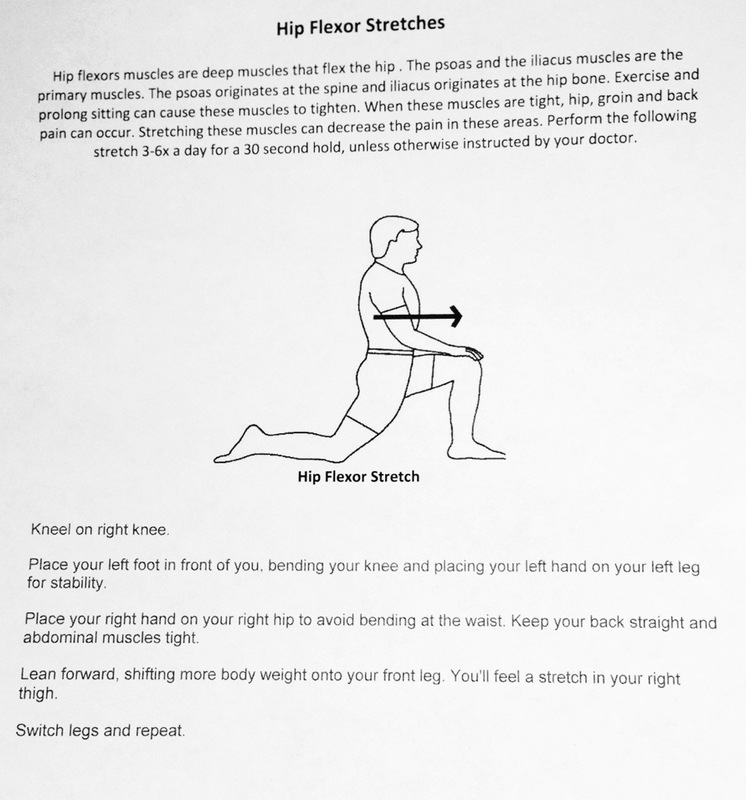 He concluded that I needed to work on core and hip flexor strength and showed me some exercises to do. So, what are the exercises? 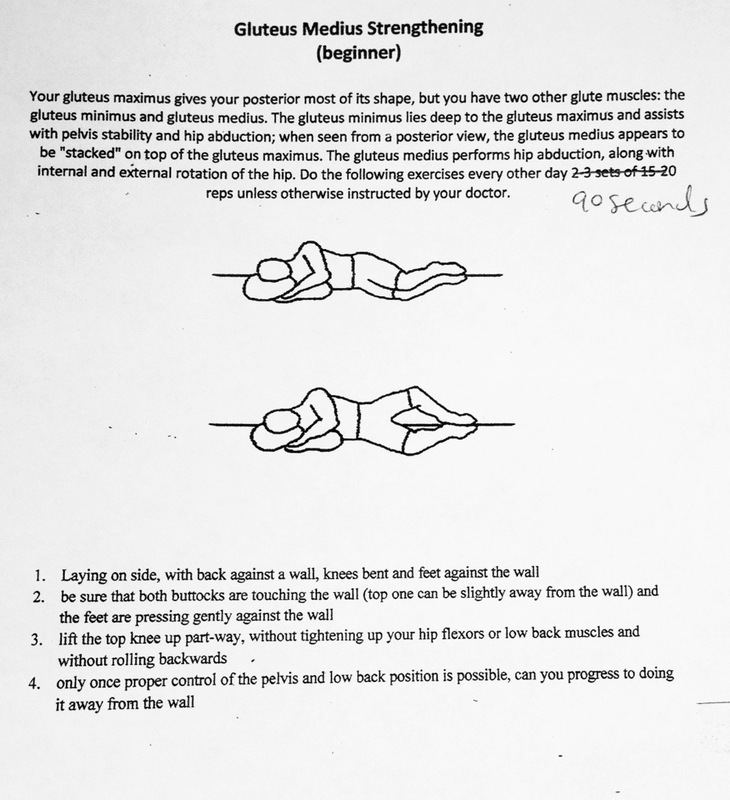 Funnily enough, two out of the three are the same exercises that the doctor showed me after I hurt my hip last time that I started out doing, but manage to maybe only do once a week now. So maybe this will ingrain it in me that I really need to do them and often. He also added a new one: single leg bridges. I do bridges all the time, but the single leg versions are supposed to work your glutes and core more. I’ve been trying to do all three exercises three times a day: when I wake up, when I get home, and before I go to bed. He is supposed to contact me after a week to see if I’m doing any better. But the best news? He said I could keep running. I was so scared I was going to have to take more time off, thus ruining both of my upcoming halfs. Tuesday I had a follow-up appointment with the sports doc about my hip injury. He asked how I did in the 10k and if I was happy with my time (yes!). He also asked if I was hurting afterwards (yes!). He was glad that I had taken the four weeks off and asked about my latest running. I told him that it was going optimistically well, and sometimes my hip would hurt when I first start running but would go away. He said that was a good thing, and it just meant I was tight, not injured. He asked if I had gotten new shoes (he wasn’t crazy about me going all minimalist from the start) and how I felt in those. Then he ran through a few leg movements and checked my leg length. He said it sounded like I was doing good, that my hip flexors still seemed a little tight, and he sent in the nurse to go through some exercises with me. 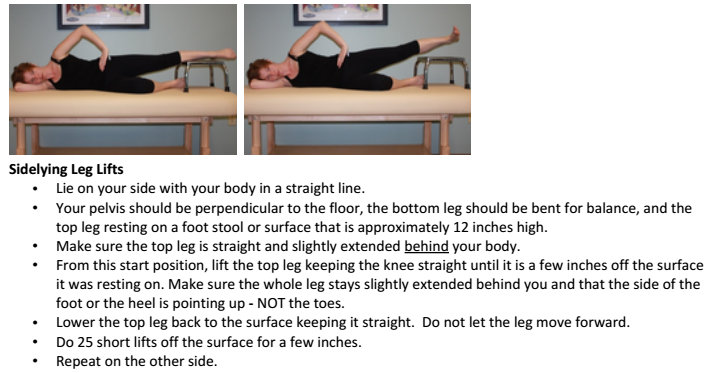 The first one she showed me is a hip flexor stretch that I can add to the other ones I (should) do. She said to do it on a daily basis and on days when I run, do it after I run. She said to add to the stretch, I can raise one arm (on the opposite side of the bended leg) and twist at the waist. 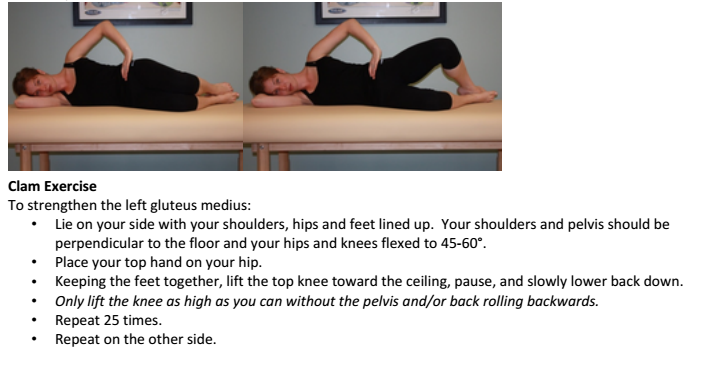 Next she showed me a strengthening exercise for the gluteus medius, which she said can get weak when you sit at a desk all day. It works to stabilize the hips, so it’s important to keep it strong when you run. She said to do this every other day for 90 seconds at a time. I also asked the doctor when I could expect to have my endurance back since I took four weeks off. He said that I was in pretty good shape, so I should probably be back to where I was within a month. That’s good news, since my main goal for the Fremont 5k is for it to be the first 5k I run without walking!